The balcony and the location was perfect. Great value for money. 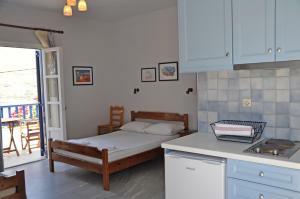 Lovely clean and spacious studio at the top of the hill next to the village. A short walk down to the bus stop, beach and lots of places to eat. A little balcony with a table on overlooks the village and coast. It was in a good location up a hill with a lovely view of the harbour and village. Very friendly and helpful hosts, who picked us up from the ferry. Very clean, new property, well furnished and maintained, and good value. Beaches are in the near and it is a nice point at sunset image. We enjoyed our stay at Nostos Studios very much. The location is on the slope of the hill, so you are able to watch beautiful sunset from the balcony while nearby village of Potamos is seen from other window. 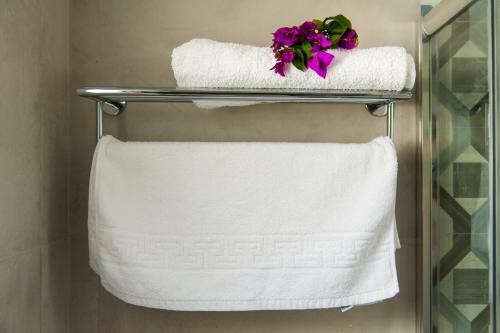 The kitchenette is well equipped and the landlady (mother of the host) can give you some more utensils if you need. She does not speak much English, however she is very hospitable and friendly. 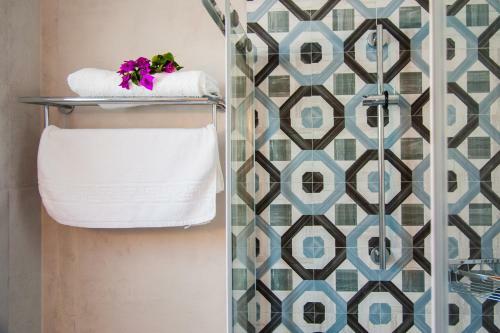 The room was spacious and airy, the shower was great (new shower cabin with plenty of space inside). Aegiali beach with fine sand can be reached within 7-10 min by foot, also several excellent walking trails start here. Great value for money. We can highly recommend this family-owned place! 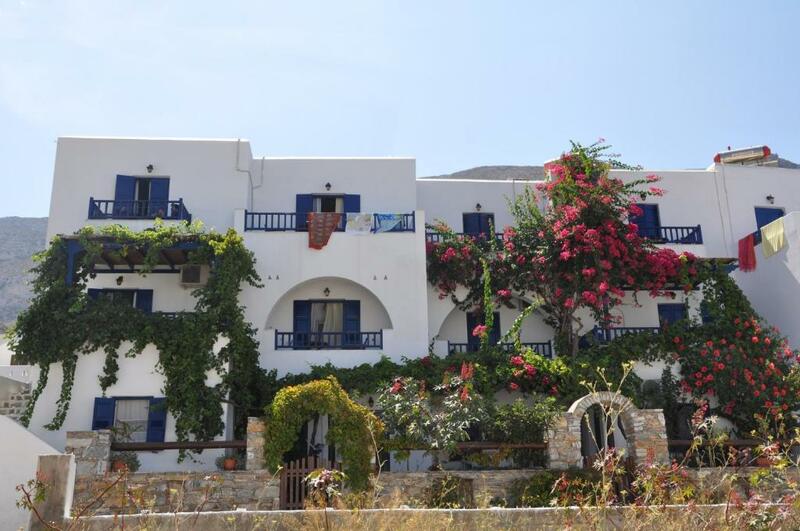 Enjoy your stay in magnificent Amorgos. When I arrived at the appointed time, the owner greeted me with a cup of Greek coffee and there was a large bottle of water in the fridge. The room was large, clean and airy, although space in the bathroom was a little confined. It was a pleasure to sit on the balcony and enjoy the view of the sea and the mountains (beyond other buildings). The facilities for preparing meals were good and Internet access was excellent. I would definitely stay at Nostos Studios again. It is worth adding that Aegiali has several good restaurants within walking distance of Nostos Studios, mountain trails and sandy beaches. Some of the views are stunning. Good space, good balcony middle level. 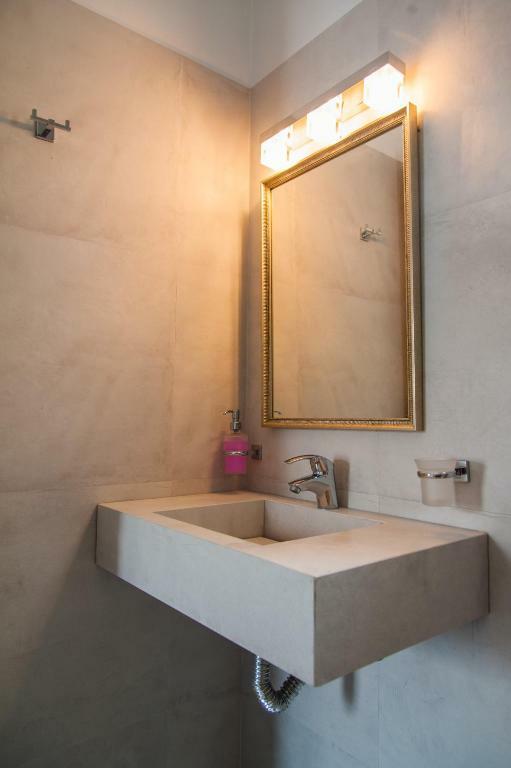 Clean property. I would go back. We received a warm welcome from the owner. She showed us our beautiful apartments with sea view and prepared a Greek coffee for us. We felt at once like home and enjoyed our stay. We surely come back to that place. 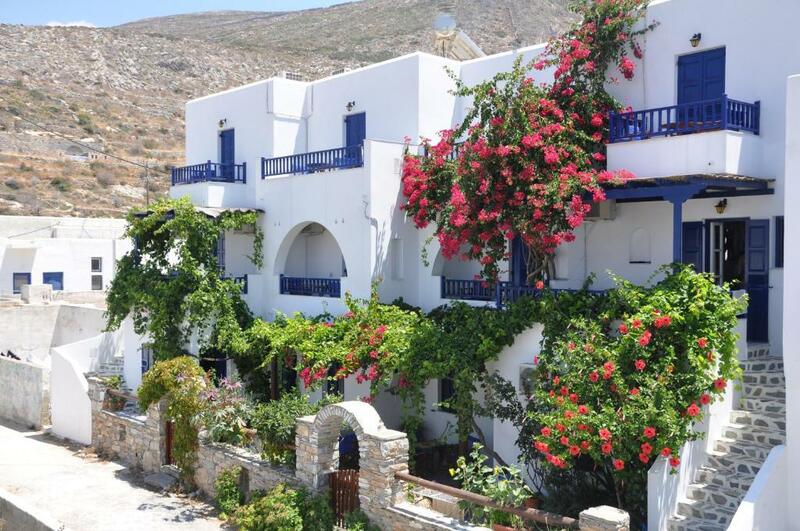 Lock in a great price for Nostos Studios – rated 9.2 by recent guests! One of our best sellers in Aegiali! 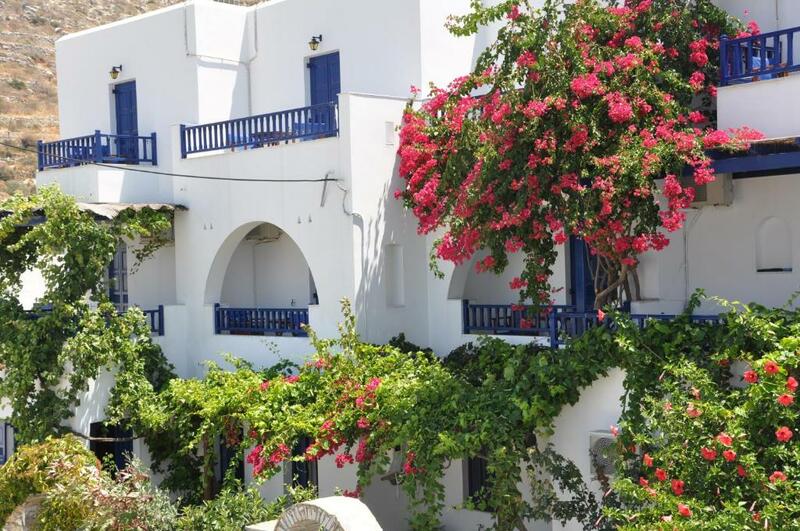 Just 650 feet from the beach and port of Aegiali, Nostos Studios offers self-catering accommodations with a balcony and free WiFi. The property is surrounded by a lovely garden. 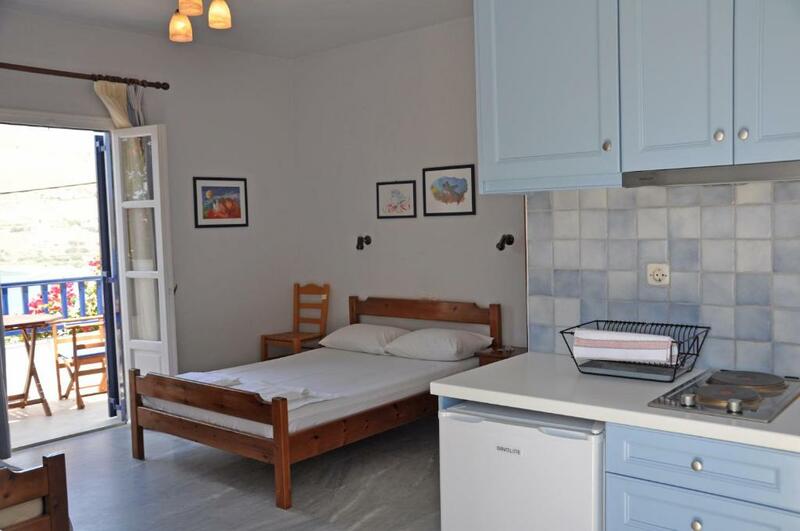 Airy and air-conditioned, all studios at Nostos have a light blue kitchenette with cooking hobs and mini fridge. Other facilities include a flat-screen TV and hairdryer. Some studios offer views of the Aegean Sea. The scenic main town of Amorgos with several restaurants and small bars is at a distance of 9.3 mi. Katapola, the second port of the island is 16 mi away. Free parking is available on site. 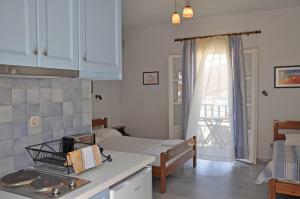 When would you like to stay at Nostos Studios? 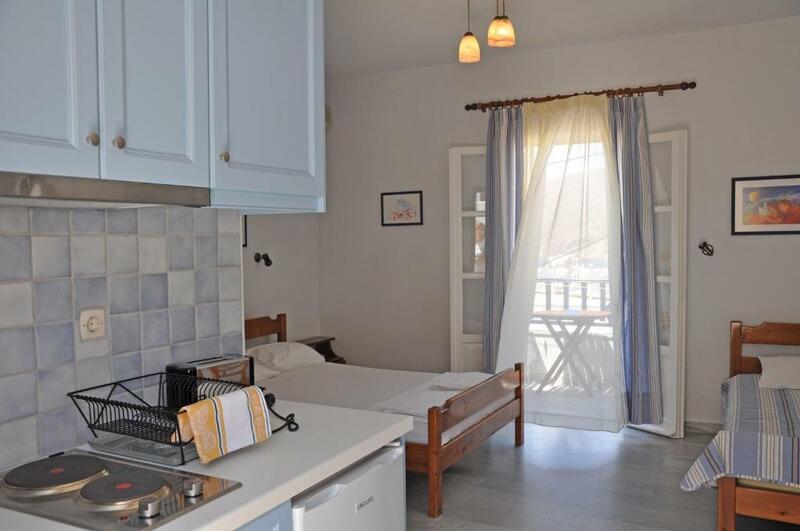 Opening to a balcony, this air-conditioned studio has a light blue kitchenette with cooking hobs and mini fridge. Other facilities include a flat-screen TV, hairdryer and free WiFi. Some studios offer views of the Aegean Sea. Nostos is located in a quiet neighborhood of Aegiali away from the bustle of the port in which there are only accommodations. It is the only accommodation where all rooms are through with all the entrances to the rooms located on one side of the building and to the other to be the balconies providing throughout the day freshness and plenty of natural light. All rooms feature at least a double bed while all bathrooms were fully renovated in early 2016. House Rules Nostos Studios takes special requests – add in the next step! Only the beds which were quite hard. We made a mistake not asking the host to wait us at the port. The host wasn’t there when we were leaving the island, so didn’t offer to drive us to the ferry. Accommodation is not far from the port,but it’s uphill and it’s not easy to arrive there by foot with a baggage when you come for the first time looking for the property. So, be sure to ask the host this in advance. Nice renovated room,terrace and view. Nostos is near enough to the port, but the walk to the studio is up a steep road. No transport was on offer, although nearby hotels did have minibuses. The host offered me free sun baked raki (delicious) and cake (even more delicious) on arrival. They were lovely and helpful and the room was spotless.